Ed Fraughton has created a dynamic small sculpture in this depiction of a Bison running full speed thru tall prairie grasses. 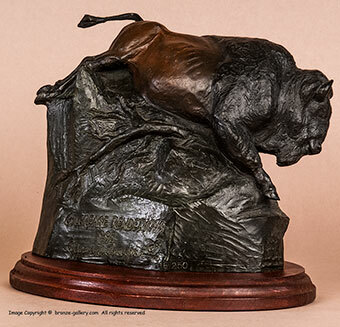 The Bison bull is patinated in a reddish brown shading to dark brown on his shoulders and the grasses are done in a dark green color. 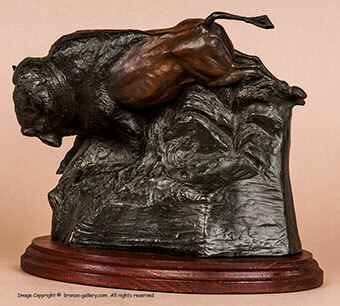 This bronze was done in a limited edition to commemorate the Gilcrease Rendezvous in 1993, it is cast number 116 of 250 casts and is mounted on the original 8 5/8 inch long by 6 1/2 inch walnut wood base.